The flower trials give us a chance to get a sneak preview of what will be available for the next season. At the Welby trials this summer, Welby Gardens celebrated 70 years of growing flowers in Colorado and gave over 400 industry people a chance to vote for their favorites from over 1,100 new varieties. The following are some of the top choices that will be available this season. The unique bright orange and yellow bicolor blooms (pictured above left) that change continually through the season made this plant a top 10 choice. The mounding habit of this plant, growing 6-12” x8-12” is great for baskets and containers in full sun. Being both heat and light frost tolerant makes it a season extender. It is an easy-to-grow variety that also attracts pollinators. Both are new additions to the famed series. Growing 14-16”x 20-24” the vigorous, supersized plants are great for large containers or in combos. The mounded, upright spreading habit with large flowers has lots of wow factor in beds, too. Geraniums will take cool season temps, but not frost, as well as heat of the summer, showing great performance all season. This top 10 pick has purple and black duo-tone flowers all summer. The 6-10”x 18-24” mounding, semi-trailing plant habit is outstanding in landscape beds or in baskets and containers in full sun. It is beautiful on its own or mixed with other colors. Bees, butterflies and hummingbirds all love it, too. The extra-large, unique, soft yellow with apricot flowers sit above dark foliage, making a nice contrast. These begonias grow 8-10” x 10-12” with a mounding, semi-upright habit. All flowers are double and upright facing above the foliage creating a colorful showing. Great in shade containers, hanging baskets or pots. The newest sister to Night Sky has dramatic dark burgundy flowers with creamy star center and spotting pattern that is more pronounced in cooler weather. 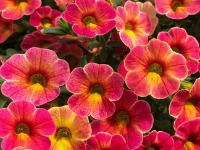 The trailing-mounding habit, 10-16” x 20-30”, is perfect for beds or spilling from containers in full sun. Another top 10 pick, this 16-18” x 12-16” tall, dark-leafed plant is a powerhouse in the garden or as a center in sun to part sun containers. Bold bi-color blooms last all season and attract butterflies and birds. Citylights series also has lavender pink, red and golden yellow blooming plants.